You can use the Bookmark feature in the Kindle Fire HD to keep track of that perfect quote or a phrase you just have to read again at a later time. To place a bookmark on a page, display the page and tap it to reveal the Bookmark button (the tool in the top-right corner of the page), and then tap the Bookmark button. A small bookmark ribbon appears on the page. 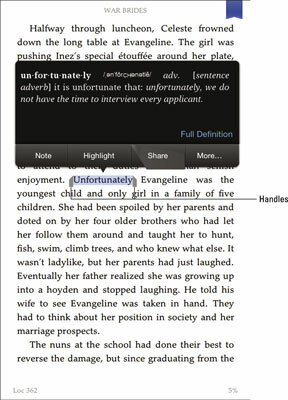 To highlight text, press and hold your finger on the text. Small handles appear on either side. If you want to select additional adjacent text to be highlighted, press your finger on one of these triangular handles and drag to the left or right. When the entire phrase or paragraph you want to highlight is selected, tap Highlight. 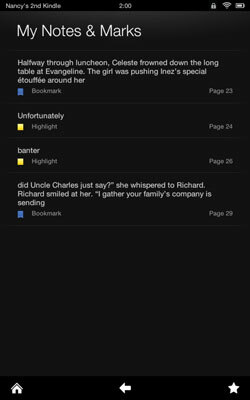 When you place a bookmark on a page or highlight text within a book, you can then display a list of bookmarks and highlights by tapping the page and then tapping the Notes button at the top of the page to display your notes and marks. You can jump to the page indicated by a bookmark or to highlighted text by tapping an item in this list. When you press text and see the menu shown, a brief definition appears from the pre-installed New Oxford American Dictionary. In the definition window, tap Full Definition to go to the full Oxford dictionary definition. 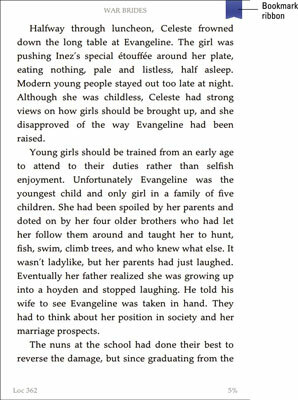 Tap the Back button to return to the book.